Please come to St. John’s for worship and fellowship this Sunday, Dec. 14. The 9 a.m. Adult Class will continue their study of the gospel of Matthew. All are welcome, even if you haven’t attended previous sessions. Sunday school for kindergarten through 4th grade will not meet again until after the first of the year. Readings Sunday, Dec. 7 Isaiah 61:1-4, 8-11; Psalm 126; 1 Thessalonians 5:16-24; John 1:6-8, 19-28. Mark your calendars. The First United Methodist church will host its Christmas Cantata on Sunday, December 14th at 5:30 pm. Next week’s schedule: On Wednesday, Dec. 17, we will have a mid-week Eucharist at 5:30 p.m.
All altar guild members will meet to hang Christmas greenery on Sunday, Dec. 21st at 3:30 pm. Afterwards, we will go to Rio Lindo’s for our yearly get together. St. John’s Good Samaritans (ECW): Please feel free to call Maureen Jones (404-697-7197) or Jeannie Turley (870-816-6387) if you are in need of some help with errands or transportation or food, or if you would just like some company. These and other members of the ECW have graciously offered their time to assist anyone needing help. If you would like to volunteer to pick up one of our older members who do not drive especially at night to ensure they can participate in all church activities, please let Maureen or Jeannie know. Also, if you need a ride to church services, but cannot drive yourself, please let Maureen or Jeannie know. Please keep the following in your prayers: Ruth Howe, Diana Reeves, Tom Choate, Gloria Tappan, Buddy Wheeler, Jaxson Robertson, Buddy & Wanda Byrd, Bishop Larry Maze, John Miles, Timothy Watson, Carol Jennings, Jayne Morris, Carvill Fitzhugh, Pam Garofas, Nina Zachary, Shawna Helton, Sarah Mouritsen, and Betty Biederman. Angels of Grace - item from their wish list this week is cleaning supplies for the home. Their office is on 406 Pecan Street. Please remember your donations for the Helena-West Helena Community Space. They are located at 105 Missouri St. in Helena. There is a list in the back of the church for items they need. Our prayers have been answered. Jody Malone Bridges has agreed to be our secretary/ bookkeeper. The office hours will be Monday through Thursday from 9:00 am.-12:00pm. MHM Navajo Christmas There are donation cards in the back of the church should you want to donate to the Mike Hardin Ministry for the Navajo’s. We have sent them support every Christmas over the last several years. I hope we will continue this support. The Christmas Poinsettia and Wreath donation insert is in your bulletin. 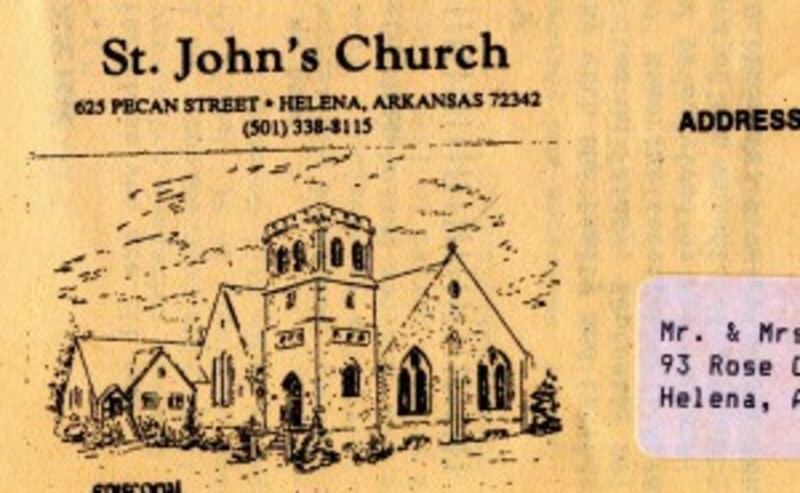 Please make checks payable to St. John’s altar guild. The cutoff date to have your name printed in the Christmas bulletins is Dec. 15. New church address! 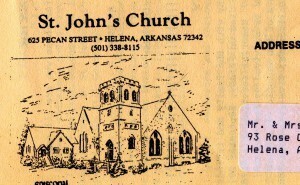 We now have a P O Box 770, Helena AR 72342. They will forward all 625 Pecan St. letters to our PO Box until Nov. 18, 2015. This was done to ensure we receive all mail and it is not just left in the office door to get wet. Our Christmas Eve service will be at 5:30 pm. With some regret, we decided to try having only one Christmas Eve service in order for everyone to celebrate together. Christmas Day service is at 11:00 am.